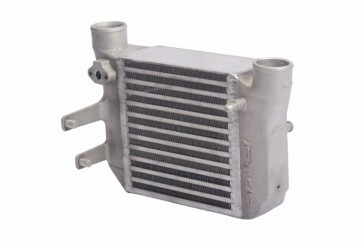 Performance Side Mount Intercooler (SMIC) for all B6 Audi A4 1.8 turbo models. This upgraded intercooler reduces excessive charge air temperature and decreases pressure loss, while simultaneously providing increases in horsepower and torque. It is designed to seamlessly bolt into the OEM intercooler location. This is a must-have upgrade or replacement for all stock and modified vehicles. Apikol's testing has verified gains of up to 13 horsepower and 25 foot-pounds of torque, while observing intake air temperatures of up to 45 degrees Farenheit cooler. Made out of cast aluminum end tanks TIG welded to a high quality bar-and-plate core.